still BEAUTIFUL two weeks later, can you believe it? The roses haven't even opened all the way. SO amazing. I just had to post a picture!! And next? 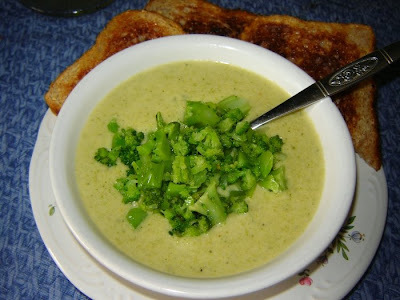 A very simple supper of Broccoli "Cheese" soup and whole-grain toast. One of my standard go-to suppers when we're VERY short on time and rushing between baseball, soccer and ballet, theater, music and PTA. You know you have days like that too. As an added plus, everyone loves it. A person eats what is served around these parts anyway, but I DO like making "favorites" when I can. This uses *gasp* a package of frozen, chopped broccoli from the grocery store for super-quick convenience, frozen veggies actually have just as much nutrition as their produce-section counterparts but if you'd rather, you can chop and cook a head of fresh broccoli instead, be my guest. The directions seem long for a "quick" meal but they're so easy! Bring stock to a boil, add frozen broccoli and onion, and simmer until barely tender, about two minutes. With a slotted spoon, remove one cup of broccoli florets. Set aside. Place remaining broccoli, liquid, parsley and salt in blender or whiz with an immersion blender. Puree until smooth. Set aside. Melt margarine in soup pan. Stir in flour and let bubble a bit. Stir in rice milk with a whisk, bring to a boil then turn heat down and simmer till thickened, stirring constantly with the whisk. Add nutritional yeast, lemon juice, mustard and tabasco and heat another 30 seconds. Stir in broccoli puree. Adjust salt if needed, add pepper to taste. Heat gently (don't boil). Serve immediately with some of the reserved broccoli florets scooped into each bowl. That sounds really good, and I think I have/can get all of the ingredients even! 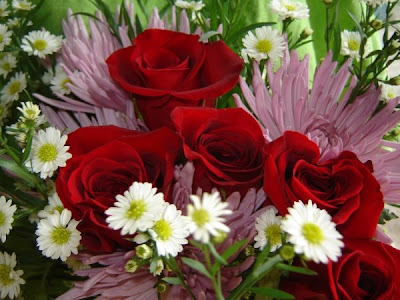 And your flowers are lovely. I had live tulips, lovely yellow. Now are looking mostly dead - and I don't know what to do to save the bulbs.... Hmmm.... Should have taken a picture when they were nice. That I'd still have! Yum, that sounds delicious! Bonus for being quick and easy! My toddler loves broccoli (score!) so we'll have to try this soon.